Opening of the exhibition with the pictures in the book. 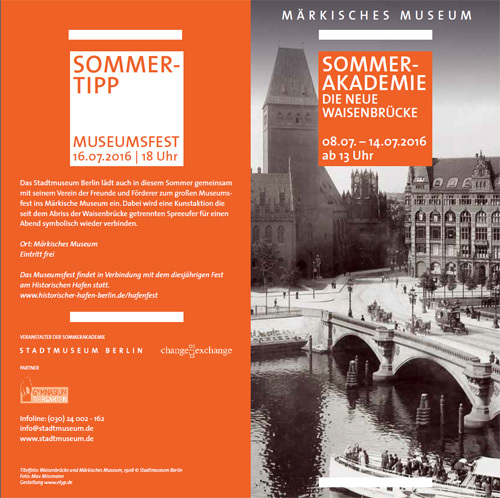 In the focus of the Sommerakademie at the Märkischen Museum is in this year the Waisenbrücke. During one week artists paint and draw open-air their version of the disappeared building. The object of the Sommerakademie 2016 is to give an impulse for the building of a new bridge at the place of the former ehemaligen Waisenbrücke. The Berlin artists Werner Aufenfehn, Axel Gundrum, Matthias Koeppel, SOOKI (Koeppel), POGO, Dirk Schmitt, Frank Suplie, Klaus Tenner and Frank W. Weber paint and draw together with their students of the Gymnasiums Tiergarten in the neighbourhood of the Märkischen Museums. Interested visitors can observe them working and regard their ideas of the new bridge at the museum's feast. A project of "change exchange" from Verein Berliner Künstler under the direction of Sooki Koeppel in cooperation with the Stadtmuseum Berlin. Prof. Matthias Koeppel, painter, poet, Prof. em. 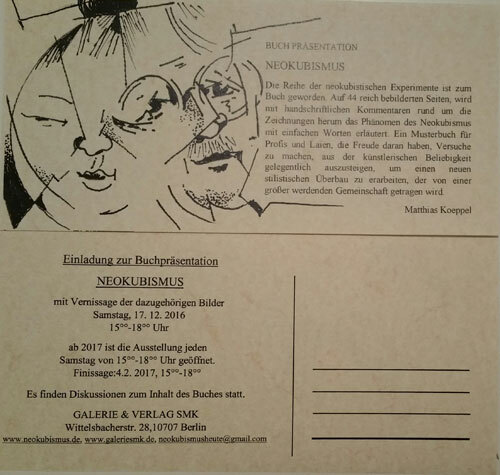 Using the example of two exhibited paintings in the Urania-Bistro, SOOKI and Matthias Koeppel present their concept of Neokubismusm, which through dissembling and new assembling geometry pictures a modified visible world. On the occasion of the Asien-Pazifik Woche the artists discuss with interested Korean colleagues and visitors, how for example Asian tradition leaves its mark on current art and regional varying values could be included into a new international style finding. A way out of the rampant general arbitary acts in the art? Mo, 02.05. - Do, 30.05. The exhibition in the cafeteria can be visited during the Urania opening hours. In the course of the invention of Neokubismus developed a picture, in which the Café-Kranzler motive was translated in Neokubistik style. The geometric fragmentation is simultaneously a symbolic hint at the projected structural rearrangement of the Kranzler-Eck. The fragmentation is enhanced through the radical black and white presentation, which is increased by a red detail. 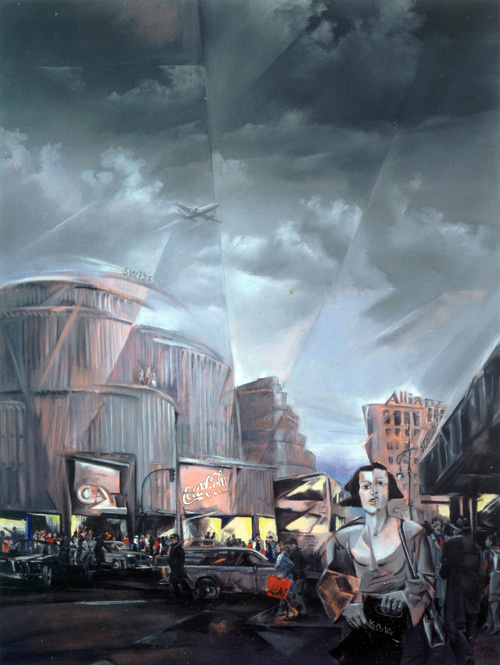 This picture was developed as part of the Kurfürstendamm-Series (2012), in which Matthias Koeppel worked with Neokubistic elements for the first time. 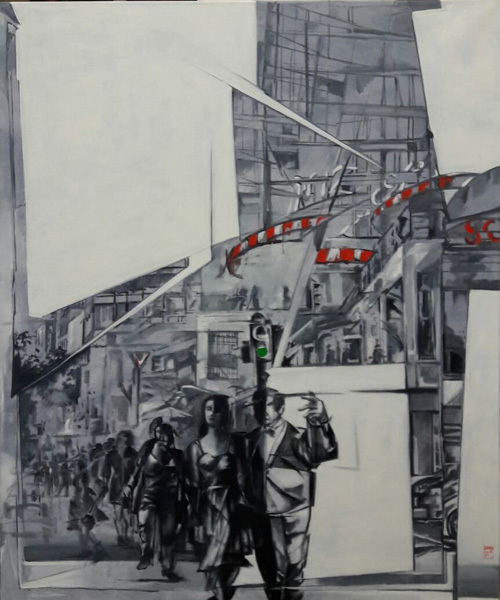 Decent geometric handling of the realistic scenery open the possibility, to merge figures and townscape into a stylistic unity.